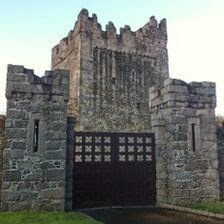 Narrow Water Castle is a 16th Century tower house and bawn* near Warrenpoint in Northern Ireland. 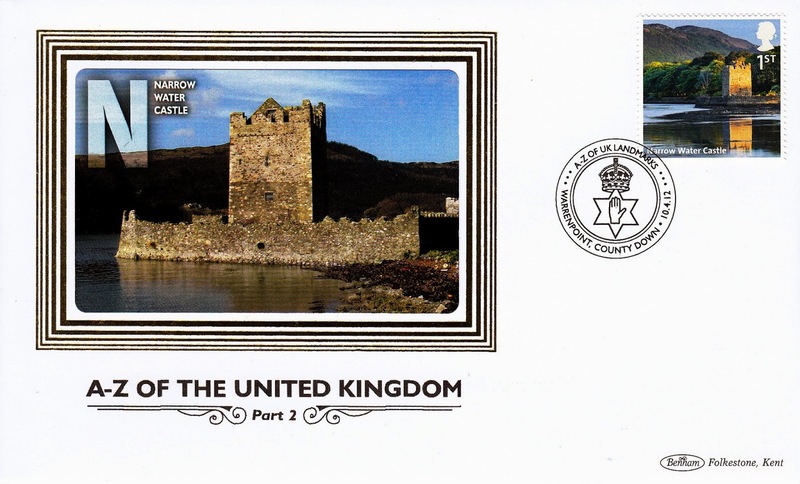 Narrow Water Keep lies on the Co. Down bank of the Newry River, which enters Carlingford Lough a mile to the south. *A bawn is the defensive wall surrounding the tower hour and its original purpose wa to protect cattle from attack. They include trenches that were often strengthened with stakes or hedges which were gradually replaced by walls. 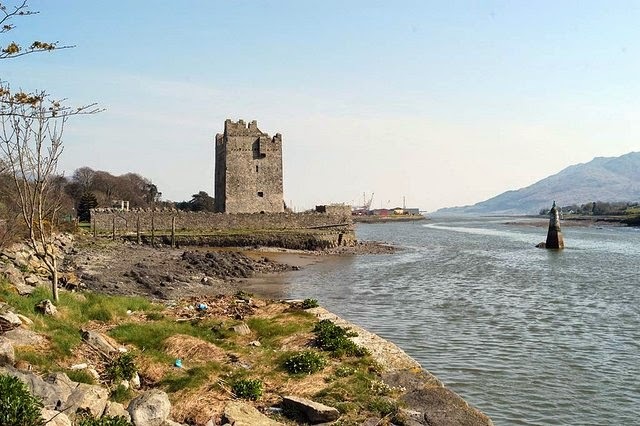 Narrow Water Keep is beside the A2 dual carriage road on the Co. Down bank of the Newry River, which enters Carlingford Lough a mile to the south. 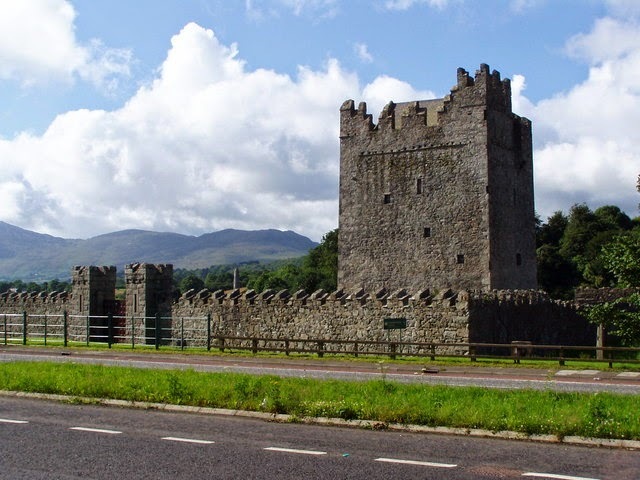 In 1670 it was sold to Francis Hall and the family owned it until 1956, since then it has been a state care historic monument in the townland of Narrow Water in the Newry and Mourne District. It guards the narrowest point on Carlingford Lough. Parking is permitted on the hard shoulder outside the castle. There has been a keep on this site since 1212. It was originally built by Hugh deLacy, Earl of Ulster, as part of the Norman fortifications, to prevent attacks on Newry via the river. The castle was destroyed in the 1641 Rebellion. Although apparently built for military purposes, Narrow Water Castle is a typical example of the tower houses found throughout Ireland from the 15th until the earlier 17th century. This form of building, normally rectangular in plan and three or more storeys high, comprised a series of superimposed chambers, with stairs, closets and latrines skilfully contrived within the walls or sometimes contained in projecting angle turrets. In 1744 till at least 1819 a saltworks was built inside the walls and in 1834 it was used as kennels. 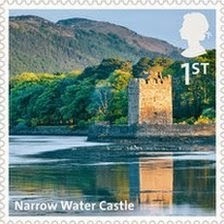 Narrow Water Castle was selected to become part of a unique Royal Mail stamp collection. Unfortunately it was also the area where the British Army suffered its greatest single casualty toll in the Troubles when eighteen soldiers were killed when two IRA bombs exploded close to the castle in 1979. 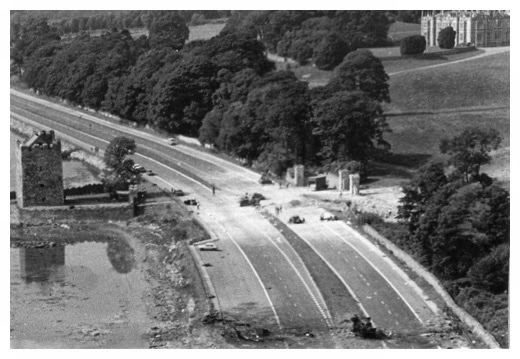 An aerial view of the scene of Narrow Water, where 18 British soldiers were killed by a double bomb attack in 1979. What a checkered past this fort has. It would be interesting to see re-enactments done here, to see how defending the river would have worked. Thanks for sharing, and for coming by and leaving a comment at my blog. We're both working on wonderful European history-related posts. I've never been to Ireland but hope to make it one day, and soon! Thanks for sharing some wonderful history and teaching me something new. I never knew what a bawn was. I love your post, and I'm glad I joined as a follower. I so enjoy traveling through the UK with you. I learn more at each stop. Narrow Water Castle today and O??? tomorrow. I can't wait. I love visiting that area of the world, and we really want to go back to Ireland. Narrow Castle sounds just GREAT! 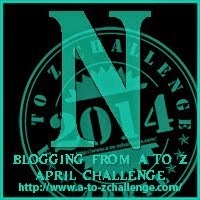 Sally, I don't know what has happened with you, me, and Blogger, but I just got "D" delivered. I had been thinking you gave up on A to Z, and now look at all this! I'm embarrassed that I haven't been visiting. I've had some comments on my posts but Blogger does seem to have a mind of its own these days.